It’s been 2.5 years since I discovered Amazingribs.com and Meathead when I was trying to figure out why my BBQ wasn’t as good as the best BBQ joints I’d visited. Last year I ordered the 2016 and 2017 Annuals from Cook’s Illustrated and Cook’s Country as well as getting into Chris Kimball’s spin-off Milk Street. This year I continued my journey with the purchase of a bunch of cookbooks in a Humble Bundle sale as well as ATK’s Dinner Illustrated and Milk Street’s Tuesday Nights, both of which focus on weeknight meals that can be completed in 1 hour or less. I also began to take some steps towards being able to cook intuitively via Samin’s Salt Fat Acid Fire which I haven’t read, but I did see the Netflix show of the same name. The prior 1.5 years were about learning my outdoor cooking techniques. There was a LOT I didn’t know about the science of outdoor cooking. Steve Raichlen and Meathead Goldwin were my tutors in this realm and dramatically increased the quality of the food I was cooking. But I was mostly still cooking the same food I always had – burgers, steaks, ribs, and pork shoulder. 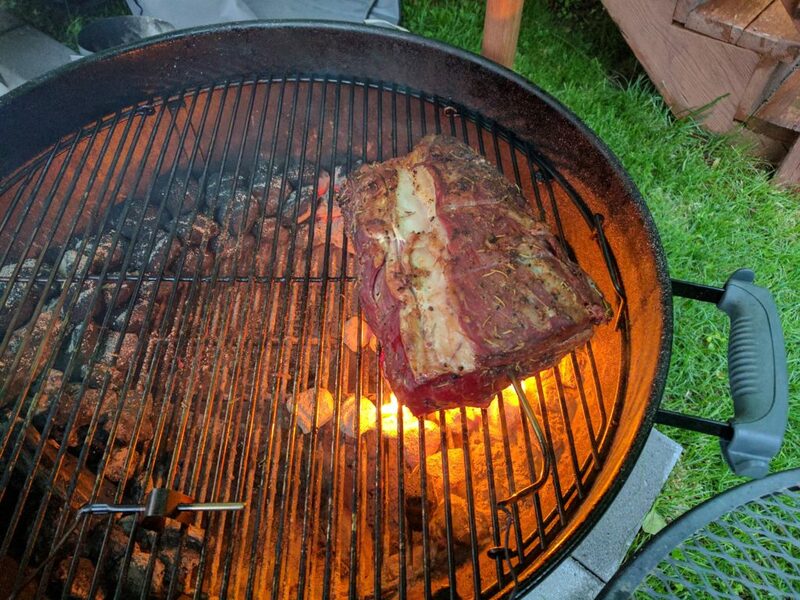 I did experiment here and there such as when I made prime rib on my kettle for Mother’s Day on my mom’s request, but that tended to be the exception, not the rule. This year was a year of expanding my repertoire. I didn’t do any new BBQ or smoking recipes in 2018, but I tried a lot of new grilling recipes. Here’s a list of what I made this year: Bacon & Egg Quesadillas, Kuwaiti Shrimp, St. Louis Pork Steaks, Grilled Bacon, Smoky Marinated Pork Tenderloin with Spicy Relish, Tacos al Pastor, Sea Bass, Fajita-flavored Fish Tacos, Curry-Spiced Tuna with warm black bean salad, ATK’s grilled chicken fajitas, Tandoori Style chicken, ATK recipe for chicken drumsticks, Mike’s Rib eyes with award winning rub, Bourbon Burger w with caramelized onions and dijon horseradish sauce, Texas Burgers, Tex-Mex Burgers, Two different bratwurst recipes, two different Italian sausage sandwiches, kielbasa spiedinis, and two different grilled cauliflower recipes! 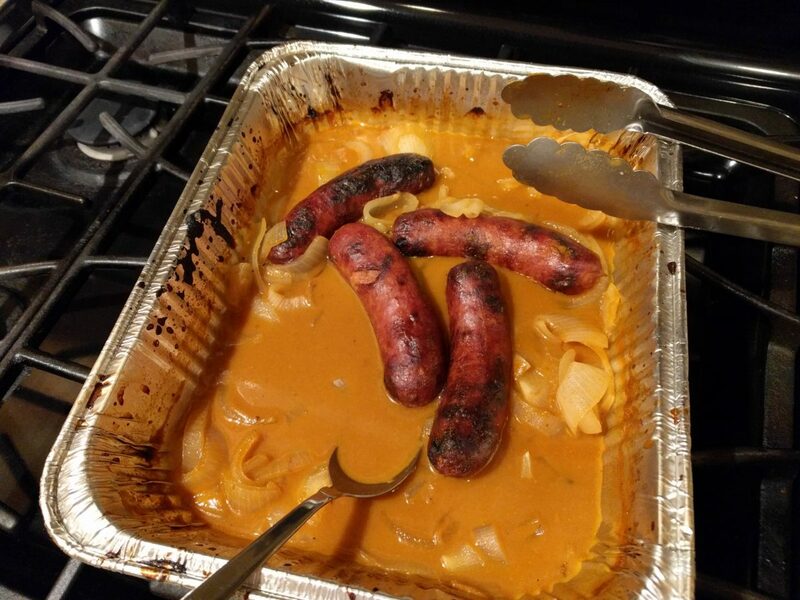 Of the new recipes I grilled this year, the biggest surprises were the various sausage recipes. Apparently, I’d always been served sub-standard bratwursts and italian sausages. 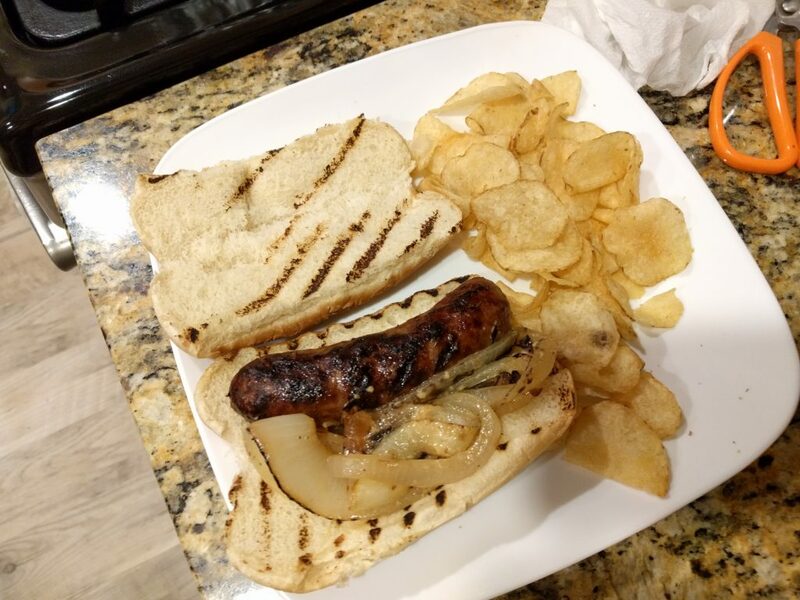 But both Meathead and America’s Test Kitchen led me to great success with their various braised bratwurst recipes. ATK’s was more mustardy while Meathead’s was braised with BBQ sauce. Given how hard they are to grill, I was most proud of the seafood I grilled this year. I overcooked the tuna the first time around, but the second time it was great. And I’ve never enjoyed eating whole fish as much as I did when I grilled the sea bass filled with aromatics. Finally, it was great to learn how to grill shrimp without toughening it up. This year I continued to gain more confidence in the kitchen as well as use new tools to enhance my food. The best money I spent this year was getting a grinder attachment for my Kitchen Aid stand mixer. In fact, I’ve used it almost infinitely more for grinding pork than I have used it for baking. While many people like the “life hack” of using a food processor to grind meat – it just doesn’t yield the same results as using a grinder. It also saves me a ton of money since pork shoulder is about $1/lb at Costco while ground pork is $5/lb. This year I made an incredible pound cake recipe (especially a lemony variant on the recipe), olive oil cake, meatball subs, Thai-style pork burgers, indoor burgers, Japanese-style breaded chicken cutlets with tonkatsu sauce, Za’atar chicken cutlets, cumin-crusted chicken thighs with cauliflower rice, chicken and cauliflower tikka masala, Japanese fried chicken, roast chicken with rosemary and garlic, roast chicken with lemon-thyme pan sauce, chicken enchladas with red sauce, Chiang Mai chicken, chicken mole poblano, pan roasted chicken breasts, fried chicken sandwiches, chipotle chicken tacos, southwestern chicken and biscuits, harissa roasted potatoes, hash browns, mushroom pork omelet, ground pork tacos, carnitas, pinchos morunos, Cuban style pork shoulder with mojo sauce, English muffins, donuts, corn tortillas, lemon-dill biscuits, heavy cream biscuits, Southern-style cornbread, beer batter cheese bread, ground beef enchiladas, picadillo, chili con carne, beef enchiladas, Georgian chicken soup, Korean pork and kim chi stew, beef and barley soup, french onion soup, chicken ramen, curry braised eggs, migas, sweet-and-spicy ginger green beans, roasted cauliflower with curry and mint, skillet roasted brussels sprouts with lemon and pecorino, brussels sprouts with garlic chips, brussels sprouts with bacon, semolina polvorones, peanut butter cookies, and oatmeal raisin cookies. The breakout star was the southwestern chicken and biscuits. It is a favorite of both Danielle and I and we’ve made it about 4 times this year. It was also the year I gained lots of experience with soups and stews. I’ve gained a greater appreciation for a food category that I once shunned. I’m hoping to try many more during this winter season. It’s also been a good year for learning how to make authentic Mexican food and great quality Tex-Mex. The beef enchiladas have become a huge hit here, for example. Finally, I didn’t realize there could be so many ways to cook Brussels sprouts. There was nothing wrong with the way we used to just roast them in the oven. But all these different recipes allow us to take the same vegetable and gets lots of different flavor profiles so that it can compliment different dishes. So what do I see for myself in 2019? Well, first of all, I’ve got a list of hundreds of dishes I’d like to try; so there is a lot of new food to try. I’d like to explore salads the way I explored soups this year. I’ve got 20 or so salad recipes I’m interested in. I want to push myself some more on the grill and BBQ. This year I added a lot of global recipes from Raichlen’s Planet BBQ and it’ll be interesting to try some of those recipes. I’m also hoping to get a rotisserie to explore how that changes things. Finally, I’d like to experiment with improvising in the kitchen. This year I bought some Za’atar specifically because there are a few Milk Street recipes that call for the herb mixture. But I’ve already started experimenting with adding a couple pinches to my salads to great results. I’ve also added it to some garlic bread and that’s been great. I want to start taking more starting points and creating dishes around that. The only thing I know for sure is that the future is going to bring more cooking and more sampling of new, tasty recipes and sharing them with the people I love.